A couple of months ago, I was contacted by POM Wonderful about trying another new product of theirs. They have a new line of drinks, POMx Iced Coffees. I was assured that the iced coffees did not taste like pomegranate. Thankfully. Because that would just be weird. Much like the rather odd music and sheep on the website. 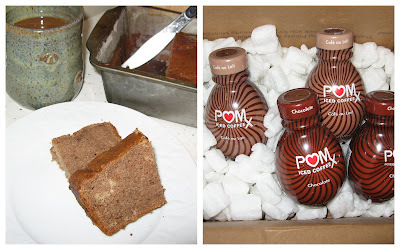 Well, I love coffee, so I was happy to receive the free POMx Iced Coffees that they sent me to try out. However, by the time that I received them, it was getting colder here in Massachusetts. For the most part, I only drink iced coffee when it's hot out, so it's taken me a bit of time to try them out. I received two flavors, Chocolate and Café au Lait. The third flavor is Vanilla, but I didn't get to try that one. All the POMx Iced Coffees contain a blend of antioxidants, caffeine, and rich coffee. I loved the Chocolate! I drank it straight from the bottle and used it in the Buckwheat Banana Bread recipe below. I didn't like the the Café au Lait too much. The texture was nice, but I found it bitter. I have a super sweet tooth, so I poured it into a glass and added some sugar. I'm sure most people would like the flavor just fine though. Well here's the recipe below. I used my mother's banana bread recipe as a start and adapted from there. It's really good! The buckwheat adds a fuller flavor to the bananas and the Chocolate POMx Iced Coffee adds a bit more sweetness, texture, and antioxidants. I hope you give it a try. Enjoy! In a medium bowl, combine all ingredients well. Oil and flour a loaf pan. Bake at 350degrees for about 65 minutes. Let cool before removing from pan. Well, if Anali says it, it must be good! I love Banana Bread, Must try this recipe!